Do you know a dedicated Lloris fan? This stunning gift is sure to raise a smile, as the recipient receives a personal message from their favourite Tottenham Hotspur FC player. The design also includes the official Tottenham Hotspur FC emblem. 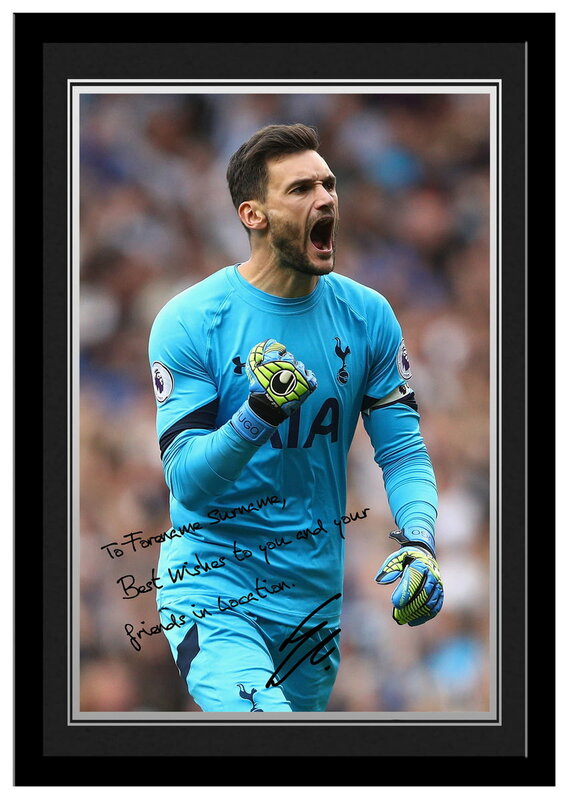 With a range of messages to choose from including Best Wishes, Playing Well, Club Ground, Father's Day, Birthday and Christmas, the Tottenham Hotspur FC Lloris Autographed Photo is the perfect gift for any occasion. Message Best Wishes to you and your friends. All the bestHappy Birthday, I hope you have a great dayHappy Father's Day, I hope you have a great dayHeard you are playing well, keep it up. Best WishesMerry Christmas, have a fantastic day. Best WishesThanks for visiting me at White Hart Lane. Do you know a dedicated Son fan? This stunning gift is sure to raise a smile, as the recipient receives a personal message from their favourite Tottenham Hotspur FC player. Do you know a dedicated Alli fan? This stunning gift is sure to raise a smile, as the recipient receives a personal message from their favourite Tottenham Hotspur FC player. Do you know a dedicated Vertonghen fan? This stunning gift is sure to raise a smile, as the recipient receives a personal message from their favourite Tottenham Hotspur FC player. Do you know a dedicated Eriksen fan? This stunning gift is sure to raise a smile, as the recipient receives a personal message from their favourite Tottenham Hotspur FC player. This Tottenham Hotspur Evolution Print is the perfect gift for any occasion.